February 2, 1917Birth, New York (N.Y.). 1937Obtained SB, City College of New York, New York (N.Y.). 1937 – 1938Tutor in Physics, City College of New York. 1941 – 2000Instructor in Physics (1941-1945); Assistant Professor of Physics (1945-1947); Associate Professor of Physics (1947-1955); Professor of Physics (1955-1976); Director, Center for Theoretical Physics (1967-1973); Chair, Department of Physics (1973-1983); Cecil and Ida Green Professor of Physics (1976-1983); Institute Professor (1983-1987); and Institute Professor Emeritus (1987-2000), Massachusetts Institute of Technology (MIT), Cambridge (Mass.). 1942Obtained PhD in Physics, Massachusetts Institute of Technology (MIT), Cambridge (Mass.). 1957Co-founded with Philip Morse, and Chief Editor, Annals of Physics. 1968 – 1975Member, Committee on Nuclear Science, National Research Council. 1969 – 1972Member, Physics Survey Committee, National Research Council. 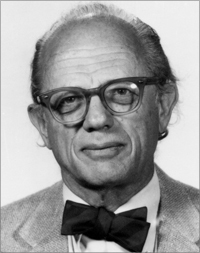 1970 – 1971Chair, Division of Nuclear Physics, American Physical Society. 1970 – 1972Chair, Ad Hoc Committee on Data Compilation, National Research Council. 1973Awarded Tom W. Bonner Prize in Nuclear Physics, American Physical Society. 1973 – 1976Vice President, Class I, American Academy of Arts and Sciences. 1974 – 1978Divisional Councilor, Division of Nuclear Physics, American Physical Society. 1974 – 1987Member, Board of Trustees, Associated Universities, Inc.
1976 – 1982Member, Executive Committee, Council, American Physical Society. 1978 – 1995Member, Board of Governors, Weizmann Institute of Science. 1979 – 1982Member, Advisory Board, Institute for Theoretical Physics, University of California, Santa Barbara. 1979 – 1983Member, National Council, Federation of American Scientists. 1979 – 1983Chair, Nuclear Science Advisory Committee, United States Department of Energy and National Science Foundation. 1981 – 1982Member, Committee on Government-University Relationship in Support of Science, National Research Council. 1981 – 1987Member-at-Large (Nuclear Physics), U.S. National Committee for the International Union of Pure and Applied Physics, National Research Council. 1982 – 1986President, American Academy of Arts and Sciences. 1984 – 1990Chair, Nuclear Physics Division, International Union of Pure and Applied Physics. 1987 – 1990Member, Board of Governors, Tel Aviv University. December 22, 2000Death, Cambridge (Mass.). Advised by Feshbach at Massachusetts Institute of Technology in Theoretical Physics. PhD advisor at Massachusetts Institute of Technology on "Relating the Properties of Tritium to Nuclear Forces" and both employed at Massachusetts Institute of Technology (MIT). Both employed at the City College of New York. Obtained SB and Tutor in Physics. Obtained PhD in Physics (1942). Instructor in Physics; Assistant Professor of Physics; Associate Professor of Physics; Professor of Physics; Director, Center for Theoretical Physics; Chair, Department of Physics; Cecil and Ida Green Professor of Physics; Institute Professor; and Institute Professor Emeritus, Massachusetts Institute of Technology. Vice President Class I and President. Chair, Division of Nuclear Physics; Divisional Councilor, Division of Nuclear Physics; Member, Executive Committee, Council; received 1973 Tom W. Bonner Prize in Nuclear Physics; and President. Feshbach and Philip Morse co-founded the Annals of Physics and Chief Editor. Member, Committee on Nuclear Science; Member, Physics Survey Committee; Chair, Ad Hoc Committee on Data Compilation; Member, Committee on Government-University Relationship in Support of Science; and Member-at-Large (Nuclear Physics), U.S. National Committee for the International Union of Pure and Applied Physics. Chair, Nuclear Science Advisory Committee. Massachusetts Institute of Technology Laboratory for Nuclear Sciences 46th anniversary symposium [videorecording], 1992 May 14-15. Andrei Sakharov papers, 1852-2002 (bulk 1960-1990). Hans Frauenfelder response to survey on the impact of immigration on U.S. physics, 1999. Oral history interview with John G. King, 2009 November 17. Oral history interview with K. Uno Ingard, 2007 July 19. In honor of Philip M. Morse. Editors Herman Feshbach and K. Uno Ingard. Preludes in theoretical physics, in honor of V.F. Weisskopf; [essays] edited by A. de-Shalit, H. Feshbach [and] L. van Hove. "Herman Feshbach: 1917-2000", Biographical Memoirs of the National Academy of Sciences. Herman Feshbach Physics Today obituary. Methods of theoretical physics / [by] Philip M. Morse [and] Herman Feshbach. Niels Bohr, physics and the world : proceedings of the Niels Bohr Centennial Symposium, Boston, MA, USA, November 12-14, 1985, American Academy of Arts and Sciences, Cambridge, Massachusetts / edited by Herman Feshbach, Tetsuo Matsui, Alexandra Oleson. Theoretical nuclear physics / Amos deShalit, Herman Feshbach.